Keats’ poetry traces his relationship with the imagination from an idealized method of escape to disillusionment. The Odes, beginning with Indolence and Psyche envision the imagination as ripe with possibility. I am now going to speak of authorial intent, regarded by many as perhaps a taboo subject, except I find it ridiculous to overlook. Keats didn’t write his poetry without intent, nor was it unshaped by his experiences. Otherwise he would never have come up with the concept of the Vale of Soul Making which is strictly reliant upon believing that the trials of experience construct the self through the soul. He didn’t “accidentally” compose anything. Overall his prospects in life weren’t looking so good. His personal life was a mess, everyone around him he cared about was either dying or already dead. He could not marry his love interest. And as for his career, he didn’t really have one. He gave up medicine to become a professional poet/writer, and didn’t exactly receive national acclaim in the beginning. All this before he finds out he has TB. And in The Eve of St. Agnes, the once exulted imagination is referred to as a “whim,” akin to a young girl’s fantasy, with the implication towards its fleeting nature and lack of depth. The innocence of ignorant bliss, dashed off in ecstatic lines, begins to cool, and by the time he comes to Autumn and Melancholy he is disenchanted with the notion of escape, but would rather “glut [his] sorrow on a morning rose,” and find beauty within reality, thorny as it may be. Consequently these poems are considered some of his finest. Contemplating the narrative on an urn, or playing with Psyche in the forest of the mind must come to an end. Much like autumn hints towards closure, his poem deflects a sense of an ending, and rather celebrates said closure, extolling the brilliance the season has to offer. 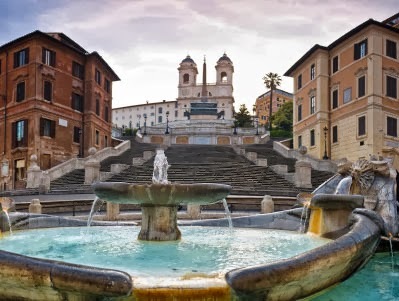 In his final months, in a last attempt to shake off his TB, he moves to Italy to a small house overlooking the Spanish Steps. As he enjoys their beauty he does not imagine narratives for them, but rather writes to his friends that their sight, as is, suffices.